Watching Luke Skywalker navigate the narrow trench of the Death Star in Episode IV elicits many different emotional reactions from moviegoers. They feel the urgency of the situation and fear for his safety, while cheering him on as he makes his way closer and closer to the space stations one weakness. But simply living vicariously through the young Padawan was not enough for many earthbound amateur Jedi's, so Atari decided to give the masses an ability to pilot their own X-Wing and save the galaxy without the need to check midichlorian levels..
Programmed by Bob Smith and released in 1983, Star Wars: The Arcade Game revolutionised the interactive entertainment space by bringing fans a fully-immersive space simulator where the user takes the perspective of a rebel pilot as they race against time to stop this galactic menace. Although the game featured a storyline out of Episode IV: A New Hope (The Battle of Yavin, if you wanna be a nerd about it), the title was put on the market at peak hysteria, in the wake of the theatrical release of, Return of the Jedi, the third and final chapter in the saga, giving the arcade game an immediate and ravenous following by fans of the franchise. In fact, this iconic arcade experience ultimately landed at #4 on the Killer List of Video Games "Most Popular Ever" ranking. Not only did Star Wars become the most successful attempt at a game/movie tie-in ever, it also served to push the gaming industry forward with its state of the art 3D colour vector graphics. These impressive visuals were also supplemented by the voice work of "Red Five" himself, Mark Hamill, along with Sir Alec Guinness as Obi-Wan Kenobi, Harrison Ford as Han Solo, and James Earl Jones as Darth Vader. While there was a stand-up arcade unit created for Star Wars, it was the sit-down, cockpit version that truly captured gamers attention. Putting you right in the middle of the action, the cockpit immersed you in the game and allowed you to become the X-Wing fighter you always wanted to be. With a yoke control (turning left or right allows for roll and yaw, while twisting forward or backward will affect pitch) consisting of four buttons (2 trigger and 2 thumb), you can manoeuvre the trench and blast away at TIE Fighters using lasers located at the edges of your four wings. The design of the game allowed players to take on the Empire in three waves. In the first stage, you man an X-Wing Fighter and proceed to rumble with TIE Fighters and Darth Vader's personal ship. In the next stage, you are required to deftly manoeuvre past enemy towers and turrets on the Death Star itself. In the final showdown, you find yourself in a familiar and thrilling position, speeding through the infamous trench of the space station, avoiding countless obstacles with the goal of firing a proton torpedo at the tiny exhaust port target. If you are able to harness the force and destroy the Death Star, the game will end in a beautiful array of colours, signalling the demise of the Imperial sphere of destruction. 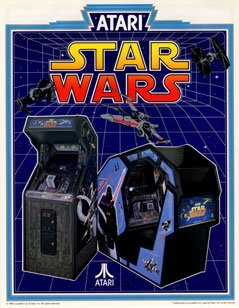 In the halcyon days of the arcade boom, it was the high score that ruled all, and Star Wars was no exception to this rule. Although the main goal was to blow up that pesky Death Star, it was the point totals that proved your piloting ability. In 1984, Mr. Robert Mruczek hit the 300 million point mark after 49 hours of gameplay, while in 2005, Brandon Erickson set a global endurance record of 54 hours using a single credit. Realising that you can play this game indefinitely on factory settings, it was eventually decided to put the machine on a harder setting for official competitions, making Star Wars more a game of skill than pure endurance. In 1986, David Palmer scored 31,660,614 in seven hours on this tougher setting, and to this day, is still the top name in the Guinness Book of World Records. Every gamer/Star Wars junkie living during the golden age or arcades will inextricably link the film with its "simulator" making the game an icon in its own right. Considering the less than stellar track record games based on films have had, we will likely never see such a successful movie/game crossover ever again. If we do, lets hope it includes a sit-down cockpit, vector graphics and unlimited helpings of nostalgia.